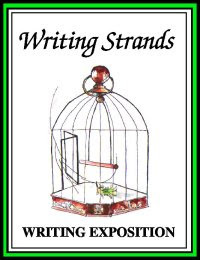 This writing program is the last in a series of the Writing Strands Curriculum -- Writing Exposition. I recommend you use this book anytime in high school. There are essay examples for Argumentative, Persuasive, Expository, Compare & Contrast, as well as a Term Paper. I like the fact that there are examples. This helps your student see what is expected. The only thing that is outdated is a writing sample using old library card files -- What are those? Well, they are thing of the past really. But the other writing assignments are good exercises. I do feel the Contents page could be better organized, I went through the book and used a lot of sticky tabs to identify different writing samples. The samples are identified as Exercise 2 or 3, but the Lessons for those samples have only titles and no numbers. And the web site for Writing Strands.